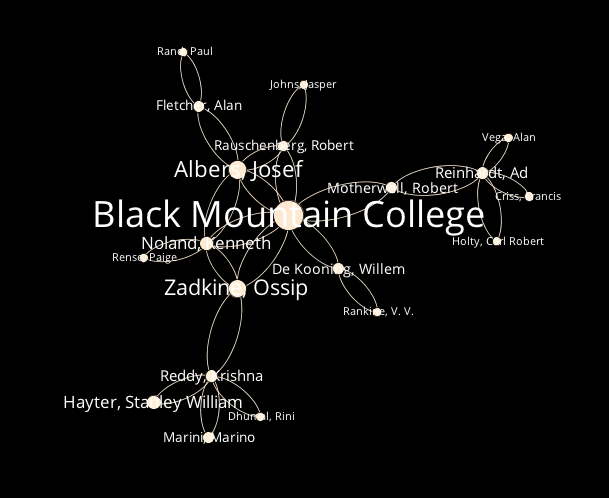 Of significant interest is that the DNB data shows how important extra-personal (looking for a word that indicates connections beyond the intra-personal) connections are for the network Cavendish constructs, and to the networks that are constructed around the reception and reputation of “Margaret Cavendish,” thus exposing an important structure in the sociable practices at play during the period. In other words, it seems that understanding the reception of a figure’s work through network graphs requires surveying more than the immediate neighborhood, or ego network, of figures just one edge away from Margaret Cavendish (or Rembrandt van Rijn, for that matter.) It is, of course, the relationships between these first, second, or third-level nodes that actually constitute the public conversation about the root author or artist, the conversation we are so eager to better understand. It was after I dove into Gephi last week that I found Scott Weingart’s excellent overview of network analysis for humanitsts.1 After a cogent introduction to the basics, Weingart offers some pointed warnings to humanists about creating multimodal networks - that is, networks with different classes of nodes (e.g. artists and organizations, illustrated below.) These require their own analytical and layout tools. One would have to customize such a scheme depending on what type of influence you were interested in visualizing; interpretation and all its accompanying biases will be layered on fast and thick. I predict this will be one of the biggest hurdles to overcome as we move forward with this project. Lincoln, Matthew D. "Looking through the ULAN with Gephi, II." Matthew Lincoln, PhD (blog), 24 Jun 2013, https://matthewlincoln.net/2013/06/24/visualizing-the-ulan-through-gephi-ii.html.